Two hundred million years ago, dinosaurs roamed the land that is now northwest Argentina. Today, those prehistoric reptiles linger as some of the world’s oldest and most pristine fossils—spanning 50 million years from when dinosaurs first appeared to when they rose to dominance in the Triassic era. 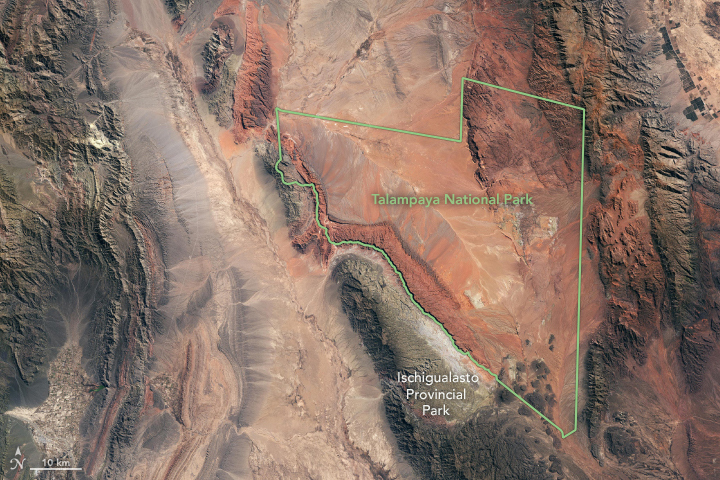 The image above shows two notable dinosaur habitats, the Talampaya and Ischigualasto Natural Parks, located near the Argentina-Chile border. 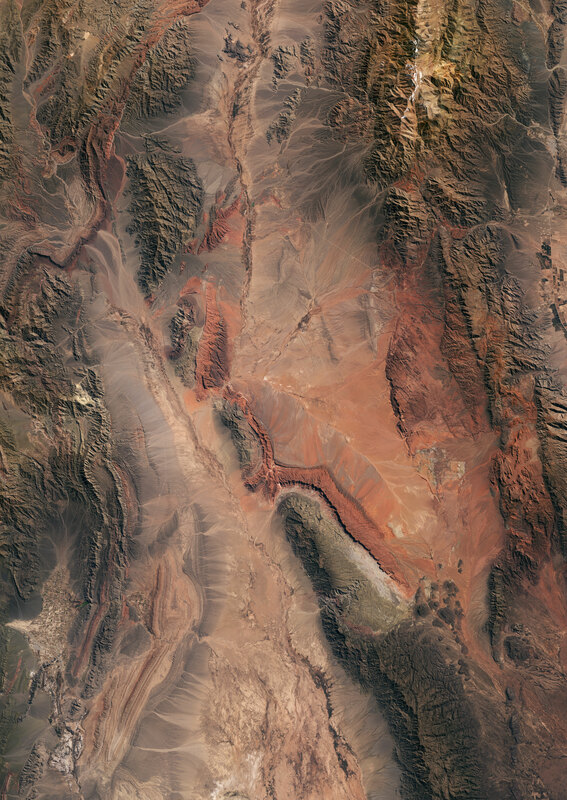 This image was acquired by the Operational Land Imager (OLI) by Landsat 8 on August 25, 2018. Together, the parks cover more than 275,000 hectares (1,060 square miles). Like a South American version of Monument Valley in the United States, Talampaya Park is known for its 200-meter (660 feet) high red sandstone cliffs and 1,500-year-old rock carvings. The image below shows a close-up view of the park in La Rioja province, where the aptly named herbivorous dinosaur Riojasaurus was discovered. Talampaya stands in stark contrast to the white and multicolor sediments of the Ischigualasto Provincial Park to the south. 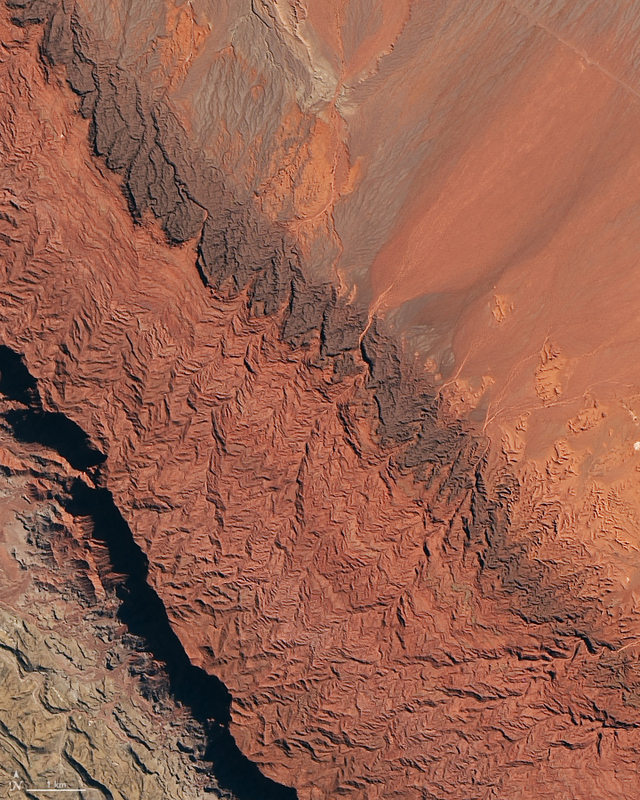 Ischigualasto is often called the Valle de la Luna (“Valley of the Moon”) because its unique and rugged terrain give an otherworldly appearance. Now a basin of sandstone and mudstone, Ischigualasto used to be a volcanically active floodplain with rivers and strong seasonal rainfall. About 230 million years ago, during the age of the dinosaurs, rock deposits filled the basin and fossilized the surrounding flora and fauna. In Ischigualasto, paleontologists have discovered a completely intact dinosaur skull of the Herrerasaurus, as well as the Eoraptor lunensis, one of the most primitive dinosaurs discovered to date. The two parks encompass Ischigualasto-Villa Unión sedimentary basin, which contains the most complete fossil record from the Triassic period (245-208 million years ago). The basin includes six sedimentary rock formations with fossilized remains, documenting Earth’s history from the appearance of the first mammals and dinosaurs to when dinosaurs dominated. The fossils also contain various species of fish, amphibians, plants, and additional reptiles. 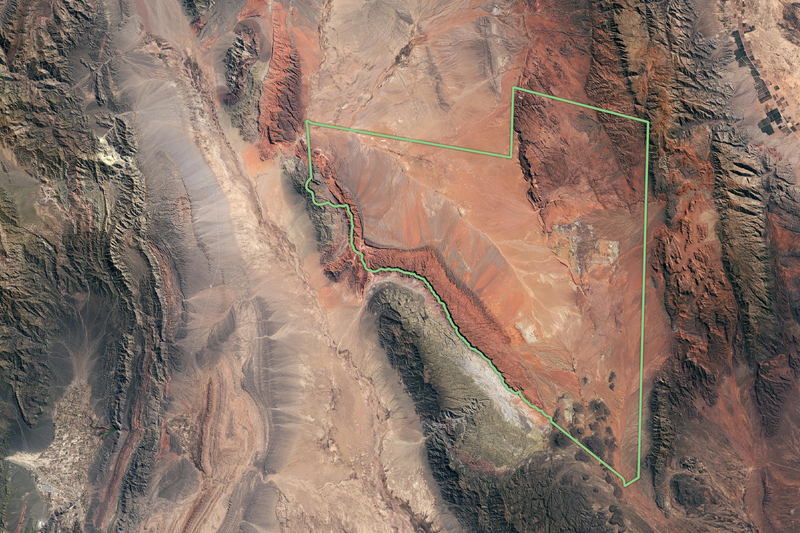 Today, the parks are arid scrub deserts located in the Argentine Monte, one of the driest regions in the country. Both parks are listed as UNESCO World Heritage sites because of their archaeological significance. The Guardian (2018, November 10) Wining and dinosauring in San Juan, Argentina. Accessed January 8, 2019. UNESCO Ischigualasto / Talampaya Natural Parks. Accessed January 8, 2019. University of California Museum of Paleontology (1998, June 6) Ischigualasto Formation, Argentina. Accessed January 8, 2019.